Inspired by the fundamental effect of secondary-sphere interactions on enzymatic catalysis, metal-mediated processes and transition-metal chemistry, our group seeks to offer an approach for the facile in situ modification and mechanistic interrogation of secondary-sphere interactions in organocatalysis. As a proof-of-concept, we modified the secondary-sphere of N-heterocyclic carbenes (NHCs) using boronic acids (BAs) under reaction conditions and tested their reactivity and selectivity in the benzoin reaction. This in situ modification afforded unprecedented enantioselectivity for challenging electron-withdrawing substrates. Furthermore, the enantioselectivity is highly reproducible in the presence of BAs in contrast to the reaction with the catalyst alone. 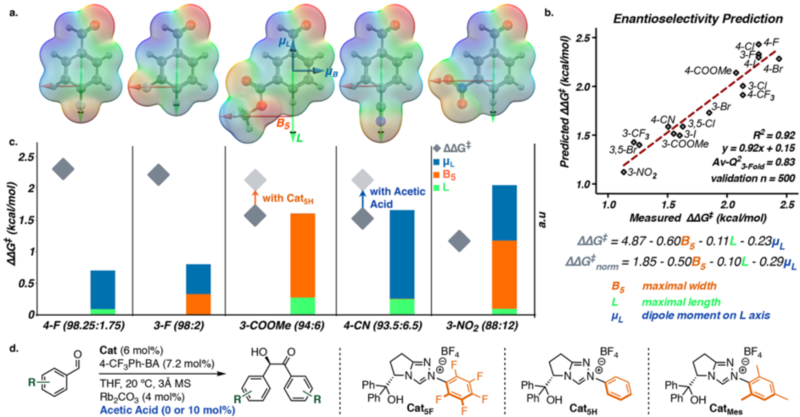 We used machine learning techniques to uncover the structural origin of enantioselectivity, suggesting two possible reasons for its erosion in this system. This strategy allowed us to propose two different methods for improving selectivity. 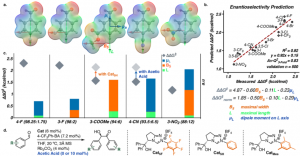 Our mechanistic studies unraveled the dual role of BA in determining enantioselectivity and mitigating the racemization of the benzoin product.